An extremely common and very familiar little plant with a rosette of leaves pressed against the soil surface and a single flower-head carried on a stalk about two or three inches high. 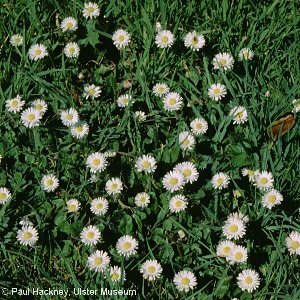 It grows in short turf in a wide variety of situtations including lawns, golf-courses, playing-fields, pastures and roadside banks, or as a weed of arable fields and garden borders. 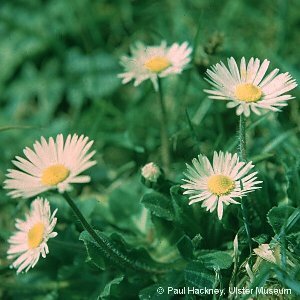 All names: Bellis perennis L.